Years ago I wondered how exactly this language contact would have taken place and analysed a number of lexical fields and grammar areas and mechanisms (Miglio 1992), hoping to reach a conclusion about the question of intelligibility between the Old Norse and Old English (henceforth ON and OE) and whether English was indeed born out of a pidginised mixture of the two. Ten years later, Þórhallur Eyþórsson, in his very interesting paper about Egill Skallagrímsson in England reached similar conclusions about there being mutual intelligibility between the two languages (and he says it with a lot more flair, cf. Eyþórsson 2002), which would probably prevent any sort of pidginisation. The topic was also amply discussed in Matthew Townend (2000, 2002), who also argues about mutual intelligibility of the two languages, as well as sketching a very detailed analysis of the modalities of contact. In this paper, I would like to concentrate on legal terminology in some documents pertaining to the Anglo-Saxon period to explore the consequences of the contact between the two languages, and the perception of language by its speakers. This matter-of-fact observation, was to be compounded by the portents, death and destruction connected with the attack on the Lindisfarne monastery in 893, and with such premises, we can understand the attitude of the inhabitants of the British Islands when they implored “From the fury of the Northmen, good Lord, deliver us!” (IX or X century Litanies, in Geipel 1971:38). This has traditionally been considered as the beginning of the so-called Viking Age in which Scandinavian peoples would extend their influence from Byzantium to Greenland and North America, and from Russia to the Iberian Peninsula, although it is likely that commercial development would have preceded this two-hundred year period, as already suggested by Hunter Blair (1962). If Viking raids in the British Islands first and Scandinavian settlements later were the last of the Völkerwanderungen that had started in the IV century, other examples of Germanic peoples moving across Europe had clearly shown that the conquering groups sooner or later assimilated into the local population – often because of the limited numbers of invaders. The Visigoths in Spain are a case in point: as an oligarchy that prohibited mixed marriages with the local population, they left few vestiges of a Germanic language in early Iberian Romance (Lapesa 1980: 118). I will not delve into the details of the reasons why Scandinavian marauders burst onto the European scene so suddenly, since in fact recent historical research has pointed out that ‘[t]he sudden appearance of Scandinavian raiders in the written sources can now be shown to be the logical extension of political, cultural, and economic contacts established in pre-Viking Age’ (Forte et al, 2005:1). It should also be underlined, following the reasoning offered by the renowned historian Henry Pirenne (1969) that there was a historical and economic background that favoured their raids. It should be remembered that the pillaging and killing that followed Viking incursions was considered little more than a ‘summer job’ by the Scandinavian, as an extension of commercial enterprises (Byock 2001:12-13). With seemingly no moral qualms, maiming or killing was a justifiable side-effect brought about by the reluctance of the victims to part with their prized possessions. The fact that the Scandinavians enjoyed an undisputed control of the sea and coastal routes, was a consequence of the Arab conquest of much of the Mediterranean coastline, making the Mare Nostrum a barrier to European commerce for the first time, rather than a connective waterway. Focal points of commerce then started to move to the Middle East on the one hand and to the North Sea on the other. After all, the documented interactions between Charlemagne and Offa, king of Mercia (Nelson 2001:136-139) or the archaeological excavations at Hedeby in Denmark and Birka in Sweden, as well as the disagreement with Offa that brought Charlemagne to close Frankish ports to English merchants in 789 demonstrate that there was considerable social and commercial interchange among different nations in Northern Europe during that time. At the same time, Pirenne (ibid.) also maintains that had Charlemagne not crushed the Saxons of North-Western Germany and the Frisians, the only maritime people that could have contrasted Scandinavian hegemony on the seas, these might not have irrupted so violently upon the VIII century European scene. It is a fact, besides, that in the economic stagnation that ensued from the interruption of commercial trade with the orient, countries reversed to a static, and mostly agricultural, subsistence economy in the VIII and IX centuries. The Church was the only institution that owned land, buildings, and cash, thanks to donations and offerings. It is also the main reason why the Scandinavian marauders attacked the British Isles monasteries first and foremost (Lindisfarne in 793, Jarrow in 794, and Iona in 795), when these enjoyed a period of cultural and economic prosperity. After the death of Mercia’s able king Offa (796), the time was ripe for the arrival of Wessex on the medieval English political scene. It took the Scandinavians approximately fifty years after the first attacks to the monasteries and after many other raids to consider the idea of settlement on British soil. Fist we know that a viking contingent spend the winter of 851 on the then island of Thanet, Kent, and again in 854. The great army mentioned in the Anglo-Saxon Chronicle inflicted a series of defeats on the various Anglo-Saxon reigns, and even Alfred the Great had to ‘buy his peace’, i.e. had to sign an agreement (the very descriptive Scandinavian term is in fact friðkaup, which was also imported into Old English) with the Scandinavians in 872 (mostly referred to as Danes, even if at this time it was a rather blanket term, not exclusively reserved to people from Denmark). This allowed him to reorganise his military defences by instituting a standing army, new fortifications (burghs) and especially establishing the first English naval force (see Gifford and Gifford 2007, Abels 2007). However, while he was doing so, a task that required years, Guthrum -a Danish chieftain- led an army against Wessex in 878 and forced Alfred to his retreat to Ethelney, in Somerset. A second battle fought at Edington in the spring of the same year was won by Alfred, which forced Guthrum to sign a treaty and to convert to Christianity. This conversion, with Alfred as godfather, actually legitimised Guthrum’s power in the Danish territories in England, and reassured the Anglo-Saxon population that they would be governed by a Christian king, on a par with the Anglo-Saxon monarchs with whom he was signing agreements. In 886, Alfred and Guthrum defined the borders of the territory subject to Danish legislation (see Fig. 2), the Danelaw. Even during Æthelstan’s reign over half a century later, when the whole of England was unified as far as the Firth of Forth under West Saxon rule, the Danelaw still maintained its distinctive cultural and legal characteristics. The fact that there was a territory occupied by Scandinavians and recognized by the West Saxon kings does not mean that there were no more viking raids on British territory, quite the opposite, in the second part of the IX century, England had to defend itself even from attacks from the Scandinavian bases in Ireland. In fact, Forte et al. 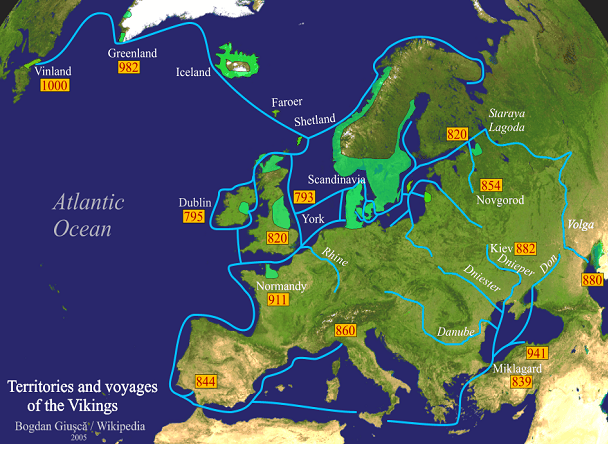 mention that Norwegian plundering expeditions were to harass the Norman rulers of England as late as 1101 and 1152 (2005:216), intent on plundering, however, no longer on conquering and settling on English soil. Loyalty to English kings from Scandinavian subjects was not always to be counted upon, so much so that the weak Æthelred, dubbed the Unready, resorted to buying the Scandinavians off with a sum of money called appropriately danegeld ‘Danish payment’. 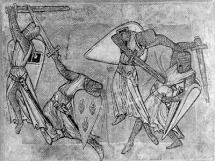 This custom may in fact have encouraged attacking Scandinavians, and as a retaliation against a massacre ordered by Æthelred of the Danish population living in England in 1002, the Danish monarchy led a campaign that ended with Canute’s succession to the throne of England (along with Norway and Denmark) from 1016-1035. After the death of Canute’s sons, in 1040 (Harold Harefoot), and 1042 (Hardacanute), the West Saxon dynasty was able to reign again through Edward the Confessor (Forte et al, 2005:199), who was then defeated by William the Conqueror in 1066. If the Danelaw had been independent only for about 50 years, those legal and cultural characteristics were nonetheless still recognized even after the Norman Conquest. Figure 2 – Scandinavian territories in England after the 878 treaty between Alfred and Guthrum. obtained some ships and sailed south towards the Seine. Incidentally, this would indirectly explain, as suggested by Sawyer (1971:99) the reason why few Western European coins have been found in Sc. archaeological excavations for the IX century, despite the hefty payments exacted for instance from the Anglian and Saxon kings as friðkaup. The Vikings with enough money would settle down locally, the others would continue looting elsewhere. We know also that there were mixed marriages from the names and patronymics in church records. The resulting generations of Anglians of mixed Sc. origin would therefore have been most influenced by Sc. customs, laws, and language. In the next two sections I will analyse some sources for language contact, but rather than concentrating on more common, everyday terms, which undoubtedly crept into the language and many of which are still used in ModE, I will concentrate specifically on legal documents, such as the XI century laws issued under Canute’s reign. It is important to take seriously Matthew Townend’s comments about the need for a more accurate analysis of these loans dividing them by place of origin and era, rather than just looking at them in a list-wise fashion that lumps together all Scandinavian loans into English regardless of time and place of borrowing (2002). By analysing some items of legal terminology, I wish to underline the influence of purely Scandinavian concepts on Anglo-Saxon laws and society. Legal terminology in Germanic languages does not seem to be ancient (von See 1964:2), it does not go back to Proto-Germanic, but rather only to the Early Middle Ages. The terms do correspond to IE roots, but they acquire their legal meaning only in more recent times, establishing themselves as specialised jargon. Von See points in fact to the various roots for the word ‘law’ itself, so different from one Germanic language to another, which would mean that the legal concepts themselves probably crystallised at the same time as the various languages were acquiring an independent form. Concepts such as ‘outlaw’ and ‘compensation’ or weregild (the compensation necessary for a murder), which are fundamental elements of Germanic law, are expressed nonetheless very differently in various languages: OE has flieman, fleam ‘to flee, flight’, German has words with the root aht (see ModG verachten ‘to condemn, despise, spurn’), and ON útlagr, sekr ‘outlaw, guilty’: utlah enters OE only after ON contact (utlaga/utlah are both recorded in Bosworth and Toller’s dictionary and compared to their Icelandic cognates, indicating their status as non-native vocabulary). The root for wer(e)gild ‘compensation for the death of a man’ is found in Old Frisian werield, and in MHG wergelt, but in ON we find manbót instead. These discrepancies not only confirm von See’s thesis, but they also amply support the jurist’s view that it is very difficult to speak of a common profile as far as Germanic legal institutions are concerned, and that even within a Germanic people (say the Longobards) there were differences that made them into an ethnic conglomerate, rather than a unified entity (as very cogently argued by Maurizio Lupoi, 2000). Despite their being so localised, legal terms are among the first loanwords in OE, in Miglio 1992 I assumed that there could be two main reasons for this, either the Sc. were superior in the formulation of their legal system, or they quite simply imposed it as conquerors on those territories where they settled, and that out of pragmatic reasons even OE speakers in territories not immediately dominated by the Scandinavians would adopt loans for unfamiliar legal concepts rather than coin a neologism for them (1992:74). Possibly because there were Scandinavian settlements in various parts of England and because presumably there would be contacts between the different ethnic groups, it was useful to be able to refer to the legal concepts of the newcomer even for OE speakers not under Sc. rule. The situation in England supports once again Lupoi’s sharp argumentation against the romantic idea that the personality of law proves tolerance towards ethnic and legal diversity, in reality each case has different immediate, pragmatic and political causes (ibid., 389). What underlies all cases are instances of mass movements of people, or situation of conquest, or favours given to foederati: a temporary situation where the understanding that people were to be judged according to their group’s legal system was prompted by pragmatic considerations, not by an intellectual tolerance of diversity. Since ON legal codes only go back to the XII and XIII century, the legal terms taken into OE often shed light on early medieval usage of those concepts, since they were adopted presumably during the Danelaw era, i.e. IX and X. Despite considerable Danish presence, many of the terms adopted by OE were already obsolete in Denmark in the pre-literary period, as they are not found in any medieval Danish document. This would confirm one of the traditional views scorned by Lupoi (2000:388) according to which personality of law could also be interpreted as the ‘cultural adherence to ancient [obsolete] values’, in this case, values and traditions that would be upheld on English soil, but that had been abandoned in the original country of the settlers. Be that as it may, ON legal terms are some of the first vestiges we find in OE. Even subscribing to the by-now accepted view that there was a high degree of mutual intelligibility between the two languages, these terms beg the question of why ON specialised terminology would be found in OE law texts: although a clear answer may never be found (Townend 2002:92), we may surmise that the untranslated concepts were possibly unfamiliar in OE law, and that there was a certain advantage in making sure that such concepts were clearly understood by the newcomers of Scandinavian origin to whom the laws also applied. Such pragmatic reasons may have been more important in favouring loanwords entering OE than questions of prestige – for instance the fact that in certain areas of Britain, the ruling class was of Scandinavian origin (in the 11th century, even some kings of England such as Cnut) – and that they may have been ‘terminally hip’ as Roberta Frank so aptly put it (2007). – 119 require formal trials. This may say more about what fiction authors and audiences found interesting than about actual statistics for crimes in medieval Iceland, but it nevertheless shows that despite the emphasis on reconciliation and arbitration, this kind of resolution may not have been so easy to get, at least for major crimes, such as murder or manslaughter. That a society of farmers with no proviso for any type of ‘official’ law-enforcement should encourage a peaceful arbitration or settlement of disagreements is hardly surprising. In fact, in contradiction to the numbers quoted by Heusler above, even just a short saga such as Hrafnkels saga freysgoða shows how –through subtle description by the ‘objective’ narrator- society did not appreciate an ójafnaðarmaður such as Hrafnkell, who was famous for not paying compensation for his crimes and misdemeanours, so much so that he has to be ‘taken down a peg or two’, when his overbearing behaviour has gone too far (with the cold-blooded killing of Einar the shepherd). But this kind of society did not appreciate people who did not know their own place either, and insisted on public trials and revenge, rather than peaceful arbitration and compensation: thus Einar’s father, embodying the type of the now old-fashioned, Viking Age individual, is also not shown in a positive light, and is described by other characters as being stubborn and foolish for not accepting Hrafnkel’s generous compensation offer. The sagas are to a certain extent contradictory in the sense that the society that produced them really favoured peaceful settlement, but what we find recorded in the majority of the sagas, are the non-peaceful ways of solving disagreements: no doubt a tension between (social) fact and the demands of fiction. It should be noticed that summoning the suspect for trial was not necessarily a risk-free enterprise (see chapter 1 of Ljósvetninga saga), and legal procedures could be concluded by a sentence of outlawry (which would essentially entail that the accusers had to kill the accused). As an advantage, the outlaw could however be killed by whomever in the community, he was réttdræpur, his life legally expendable. Involving the whole of the community in the punishment of a criminal through banishment, was also the essence of the Roman Aquæ et Ignis Interdictio prohibiting Roman citizens from offering the necessary elements of life (fire to warm up to and water to drink) to anyone who had been charged with this sentence. The effect of this sentence was ‘to incapacitate a person from residing or exercising the rights of a citizen within the limits embraced by the sentence … if the interdiction was legally removed, he might return and resume his former position at Rome’ (McKenzie 1880:412). However, if the defendant did not comply with this type of banishment, Rome had official ways of quickly transforming the sentence into a death sentence, that depending on the status of the citizen or his provenance, could be carried out by the carnifex (public executioner) or other representatives of the state. Indeed, many societies have ‘mechanisms of exclusion which stop short of actually killing the person to whom they are applied’ (Lupoi 2000:368) and, as the same author maintains, they should not all be lumped together, as they may entail significantly different conceptual bases for this punishment, for instance depending on whose authority is invoked that imposes the banishment of the criminal, royal authority or the community’s. The discussion of the source of authority for outlawry will be postponed to a future treatment of the subject, but the emphasis on outlawry, rather then the death penalty, may have been a pragmatic choice for Scandinavian groups, more akin to communities of peers than other medieval societies, and therefore lacking a policing force to guarantee that citizens respected the law (this is certainly true of medieval Iceland). The whole community was then involved in protecting itself from the ‘outsider’ the outlaw, often equated with a preying beast prowling on the outskirts of civilisation, the vargr, the wolf, who had no legal rights and must be persecuted by all. If this emphasis on outlawry and on other peculiarities of Scandinavian law were perceived as a sort of cornerstone of Scandinavian society even in Britain, it is not surprising that it is exactly this type of terminology (‘outlaw’, ‘law’, ‘compensation’, and types of murder, see below) that made its way into Old English. However, when Wulfstan II, bishop of York, writes in West Saxon and peppers his homilies and law codes with words of Scandinavian origin, one wonders (as Townend 2002:92), whether those words were aimed at a Scandinavian audience (but delivered in West Saxon! ), whether they were unusual loans, or whether their usage was already common in spoken discourse – and if so, were they common both in Scandinavian-influenced lands or even in mostly Anglo-Saxon territories? While such questions cannot be answered as of yet, I will concentrate on analysing some of those loanwords and remark on their significance within the Anglo-Saxon texts. OE lagu (f.) is probably derived from an Eastern Scandinavian form *lagu that shows no metaphony (in Old Icelandic the form in the written record is lög, nt. pl. ), in Eastern Old Norse one finds allum mannum ‘to all men’, instead of öllum mönnum with metaphony. Because of its unusual form, which hardly ever recorded even in Scandinavian documents, it has been surmised that this must have been the earliest loanword into OE to acquire common currency especially because its lack of metathesis (Von See 1964:101). Lagu is related to the ON verb leggja, i.e. ‘set down, establish, determine’, and just as the German Gesetz (‘that which is established’, same relation to the verb setzen ‘to put/lay’ as lög-lagu/leggja) and underlines the act of legal decision as a conscious act of creation. Lagu little by little substitutes the OE term æ(w) that is more and more often used for ‘customary law’. Æ(w) derives from Common Germanic e:wa, which in turn denoted rules of social behaviour within the Sippe. The word is etymologically related to Got. aiws ‘eternity’, Lat. ævum (cf. OE æ also as ‘life’). After the contact with Scandinavian settlers, æ(w) specializes into universal law, and especially divine law. The only exception in this regard is Wulfstan: in his Sermo Lupi ad Anglos, ca. 1014, since we find here for the first time lagu used with the meaning of ‘divine law’. It should be remarked that the older form in æw is not found in DOE, except for compounds such as æwbryce ‘adultery’, literally ‘breach of matrimony’, as ‘matrimony’ was one of the meaning of the word æw. Godes æ (66 cases in Ælfric alone; and 35 in anonymous homilies. Æ þine (120 cases) – þine æ (8 cases) ‘Your law’, which is always translated as lex tua in bilingual texts. Drihten, min God, ic hæfde geteohhod, … , þat ic scyle healdan þine æ symle on minre heortan. OE frith (friþ) is a word derived from a common Gmc. concept – the prosperity and perpetuation guaranteed by those rules of conduct expressed by lagu, i.e. the safety granted by the law. It can be interpreted as the King’s peace, or God’s peace. ON grith (grið) has a more specialised meaning, i.e. the truce or refuge afforded by a special place or time (such as a church or a religious event). In emphatic expressions, both terms are found side by side: friþ and grið. Their meaning in this collocation seems to be ‘peace and prosperity’. In DOE, frith (friþ) appears with 671 examples (both as a noun and as a verb). In Latin texts, friþ is translated as pax, and grið as pax, tutela, refugium, but grið is often not translated in bilingual Latin-OE texts. Another peculiarity of the ancient laws was their obsession with poisoning as being a particularly heinous way of killing someone, as well as the punishment being different according to the relation between the murderer and the victim and the status of both victim and murderer. Grágás, the 12th century code of law that for the first time in Icelandic history put to writing the essentially oral legislation of medieval Iceland has a main section devoted to homicide. There is indeed an important distinction in Old Icelandic laws about murder too, however, it does not hinge on premeditation, but rather on whether the murder is an ‘open murder’, in plain sight, so to speak, that the whole community knows about because it has been ‘openly claimed’ by the murderer and the body of the victim has been properly disposed of in the legally required period. Það er mælt. ef maðr myrðir maN oc varðar Það scog gang. eN þa er morð ef maðr leynir eða hylr hræ eða gengr eigi i gegn. Víg, on the other hand, i.e. a killing that is not concealed or committed in the middle of the night, is treated differently and has a separate chapter in Grágás. Morþ ‘murder’ did exist in OE, but after the OE-Scandinavian contact, one finds not only 143 examples of OE morð meaning ‘murder, death, destruction’, but also OE mansliht ‘murder’ with 49 examples in DOE, and especially OE morð(weorc) with the meaning of ‘secret murder’ (3 examples in DOE), a novel concept in OE. It is also singnificant that in later laws (Cnut, 1027-34), through Scandinavian influence, we find it glossed in Latin as ‘morthrum’ or ‘homicidium furtiuum’ as opposed to ‘murdrum aperte’. Gif he man to deaþe gefylle, beo he þonne utlah, & his hente mid hearme ælc þara þe riht wille. ‘If he beats a man to death, he will be declared an outlaw and should be pursued and attacked by anyone who wants to see justice done’. & gif heo forð ne cume, fo se cyning to þam were, & beo se þeof utlah wið eall folc. This last comment ‘and no one can help him’ echoes the Aquæ et ignis interdictio of Roman law, in so far as it enlists the help of the community in making sure that the punishment is indeed felt by the criminal. This type of banishment, by involving the community, brings to OE more of the flavour of the Scandinavian society of peers, abstracting away from the king’s authority and his enforcement of the laws. In this paper, I have traced the historical background of the contacts between Anglo-Saxons and Scandinavian peoples in the Middle Ages in England and sketched some remarks as to the intelligibility of OE and ON at the time of their contact. I have compared some legal concept between the Scandinavian and English legal systems in the Middle Ages, as attested from ON loanwords into English: the subject is vast and fascinating, and requires a more detailed treatment than would be possible in this paper. However, I hope I was able to show that some cornerstones of Scandinavian law, such as the concept of outlaw and the distinction between covert murder and ‘open murder’ were transferred with their corresponding loanwords into OE because of their importance in the newcomers’ justice system. The examples taken from DOE, incidentally show that the Dictionary of Old English Corpus is an invaluable tool to access all documents available in OE. This type of access is all the more important given how fragmentary the records are. Despite general dating problems in OE, legal documents are easier to assess thanks to the historical record. The use of a corpus allows one to see at a glance the increase/decrease in frequency of a form (æ, for instance), but it is especially useful in order to assess the semantic specialisation of doublets (æ vs lagu, frith vs grith), as well as to establish subtle changes in the use of pre-existing terminology (morð). For future study, I would like to carry out an analysis of the contexts in which OE laws come about that contain Scandinavian loanwords, as well as a comparative study of the concepts represented by those loanwords in other Germanic legal codes. Abels, R. 2003. ‘Alfred the Great, the Micel Hœðen Here and the Viking Threat’. In T. Reuter (ed.). Alfred the Great: Papers from the Eleventh Centenary Conferences. [Anglo-Saxon chronicle. Latin & English (Old English)]. 1692. Chronicon saxonicum, seu, Annales rerum in Anglia præcipue gestarum. Oxonii: E Theatro Sheldoniano. Byock, J. 2001. Viking Age Iceland. London: Penguin. Brown, M.P. and C.A. Farr (eds.). 2001. 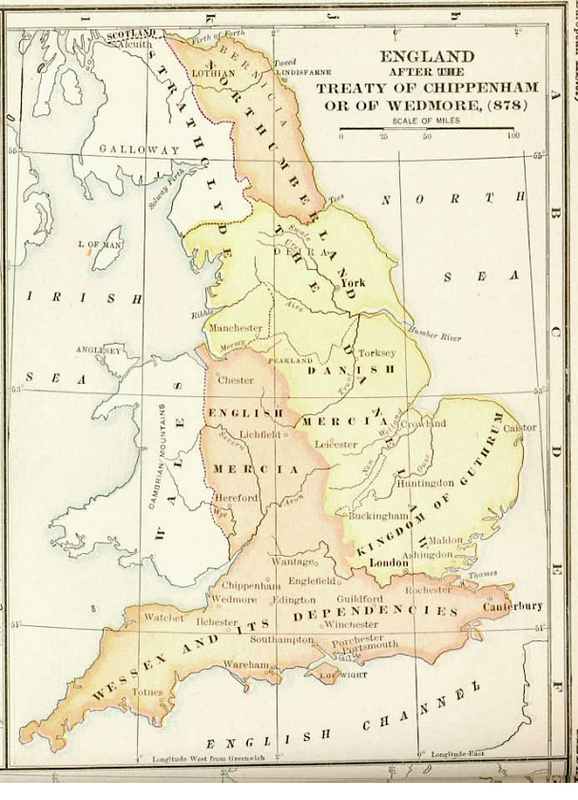 Mercia: An Anglo-Saxon Kingdom in Europe. London: Continuum. Cameron, K. (1988; 1996) English Place-Names, London: B.T. Batsford Ltd.
B,J. and T.N. Toller. 1898. An Anglo-Saxon Dictionary. Frank, R. 2007. ‘Terminally Hip and Incredibly Cool: Carol, Vikings, and Anglo-Scandinavian England.’ Representations Nov. 2007, Vol. 100, No. 1: 23–33. Geipel, J. 1971. The Viking Legacy. Newton Abbott, David and Charles. Gifford, E. and J. Gifford. 2003. Alfred’s New Longships. In Reuter, T. (ed.). Alfred the Great: Papers from the Eleventh Centenary Conferences. Hadley, D. M. and J. D. Richards. 2000. Cultures in Contact: Scandinavian Settlement in England in the Ninth and Tenth Centuries. Turnhout, Belgium: Brepols. Heusler, A.1911. Das Strafrecht der Isländersagas. Leipzig: Duncker & Humbolt. Hunter Blair, P. 1962. An Introduction to Anglo-Saxon England. Cambridge: Cambridge University Press. Jones, G. 1973. A History of the Vikings. Oxford: Oxford University Press. Lapesa, R. 1980. Historia de la lengua española. Madrid: Gredos. Lupoi, M. 2000. The Origins of the European Legal Order. Cambridge: Cambridge University Press. McKenzie, M. 1880. Studies in Roman Law. Edinburgh: Blackwood. Miglio, V. 1992. Contatti Linguistici fra Antico Inglese e Antico Nordico. Unpublished Tesi di Laurea, Universita’ di Bologna. Miglio, V. (ed.). 1995. Las Antiguas Literaturas Celtas y Germánicas. Mexico City: Seminario de Poética/UNAM. Nelson, J. ‘Carolingian Contacts’ in Brown and Farr (eds.). 2001. 126-46. Reuter, T. (ed.). 2003. Alfred the Great: Papers from the Eleventh Centenary Conferences. Ashgate: Aldershot, Hants, England; Burlington, VT.
Townend, M. 2000. Language and History in Viking Age England. Turnhout, Belgium: Brepols. Townend, M. 2002. ‘Viking Age England as a Bilingual Society.’ In Hadley and Richards 2002. Wawn, A. 1995. ‘Vikingos victorianos: George Webbe Dasent y la Jómsvíkinga saga ‘, in Viola Miglio (ed. ), Antiguas literaturas Celtas y Germánicas, Acta Poetica [Mexico City: Universidad Nacional Autónoma de México], (1995), 75-109. Þórhallur Eyþórsson. 2002. Hvaða mál talaði Egill Skalla-Grímsson á Englandi. Málfríður. 18 (1): 21-26. Forte, A., and R. Oram, and F. Pedersen. 2005. Viking Empires. Cambridge: Cambridge University Press. I would like to thank Paula Loikala as de facto advisor for that thesis, as well as Hermann Pálsson and Sorin Stati (even if posthumously, alas, for both) who, in different ways, helped with many aspects of that work. To Hermann specifically I owe an enormous debt of gratitude for encouraging and sustaining my life-long love for Icelandic literature and culture (old and new). Literally: In this year Beorhtric [king of Wessex] married king Offa’s daughter Eadburh. During his reign [786-802] three Scandinavian ships made landfall for the first time and the reeve went to meet them and take them to the royal residence, since he did not know what type of people they were. But they killed him. Those were the first ships of Danish men that arrived to the land of the Angles. Some researchers believe these dates are off by two or three years (see for instance Lupoi 2000). Brönsted (1960:10) maintains that the Visigoths in Spain were about 200.000 and that the Ostrogoths in Italy were 100.000. After all, they were already latinized, after serving as fœderati of the Roman Empire since the beginning of the V century (Honorius grants them land to settle in Aquitaine Gaul in 418) and establishing their capital at Toulouse. Anglo Saxon Chronicle, 1692:74, 78. Two of the local towns on Thanet are Ramsgate and Margate, which betray their Scandinavian origin (having the same generic element gate ‘road’ as Edinburgh’s famous Cowgate, for instance, and Hrafn ‘Raven’ (or a common ON male name) could be the specific element in Ramsgate), although the local history of the respective municipalities does not mention this possibility. The epithet in modern English is only due to the assonance with the King’s name and implying his ineptitude to political command; in reality, since his name means ‘noble counsel’ in OE, the nickname Unræd is a cruel pun since it means ‘bad advice’. But even Stanton (1971:374) defends Æthelred, whose ineptitude was in fact due to the impossible circumstances under which he became king – he was after all only 10, and his reign lasted from 978 to 1016 under continuous attacks and raids. See Hadley and Richards (2000:3-16) for a discussion of problems related to the interpretation of the existing sources. See Miglio 1992 for a more complete treatment of linguistic issues. See Wawn’s article on the Jómsvikings in Miglio 1995. However, Townend’s criticism about the loose dating of ON loanwords into English should be taken seriously (2000:92-3), since loans have often been considered as a mass of items lumped together in a list without much concern about the date or the provenance of their intrusion into English. Miglio 1992, Townend 2000, 2002, and Eyþorsson 2002. Although the Sagas of Icelanders span the period of the Settlement, 870-930 C.E., to around the year 1000, one should of course consider that they are really the product of 13th century Iceland. We could thus say that the anonymous saga-author at least projects those values on the Icelanders that lived about 300 years earlier. See the entry for Capital Punishment in http://www.newadvent.org/cathen/12565a.htm (accessed on 15/02/10). The study of loanwords is based on Miglio 1992 and the Dictionary of Old English Corpus (DOE), a corpus compiled by the Centre for Medieval Studies, University of Toronto, as part of the Dictionary of Old English Project. The interface was developed by the University of Michigan Text Encoding Initiative. The corpus contains at least one copy of every Old English text ever written, and in many cases more than one copy, if it shows different dialectal characteristics. It contains 3 million OE words, as well as 2 million Latin words, for a total of 3037 texts. An electronic version of Wulftsan’s ‘Sermon of the Wolf to the English’ is available at http://english3.fsu.edu/~wulfstan/ (15/02/10).